S4 Hemphill Pet-Friendly Studio Georgia Tech students rejoice! 935M Apartments has luxury pet-friendly studios available in the heart of Midtown Atlanta. At 600 sq ft, the S4 Hemphill studio has ample space for you and two furry friends max. All our units are elegantly designed and decorated with stained concrete flooring, floor to ceiling windows and granite countertops. Live in style at 935M! The layout itself is streamlined and full of storage space. 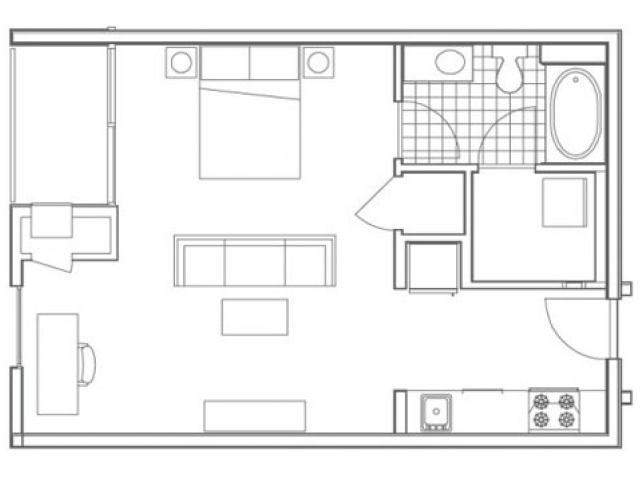 With an open floor plan for your bed, couch, tables and more, you can do a lot within 600 sq ft. Luxury Amenities At 935M Apartments, we love our fur babies, so the S4 Hemphill studio is pet-friendly for all our tenants. As a resident, you'll get several perks of our luxury space, including a resort-style pool, fitness center, lounge area and conference room. Our maintenance staff is always ready to help 24/7 and we make paying rent easy as logging in. All of this with a beautiful view of the Atlanta skyline from your apartment. Located in the Heart of Midtown Great for Georgia Tech students, 935M Apartments are only blocks from the school. Midtown is also chock full of great restaurants, cafes, shops and more. Enjoy a stroll in Piedmont Park or The High Museum of Art on an afternoon. With quick access to I-85 and Northside Dr, you can get anywhere in Atlanta (or out of town) quickly. Schedule a Viewing Today Looking for an apartment to rent in Atlanta isn't always easy, but with 935M Apartments, we make it a breeze. Learn more about our luxury amenities in and out of the studio as well as residential perks. We offer tours for the S4 Hemphill studio, so Email , call (866) 991-5178 or apply today to learn more about the S4 Hemphill luxury studio apartment.